New exhibit at Ben-Gurion Airport displays 60 breakthroughs Israel has given the world, to be viewed by 8 million passengers. A unique new exhibit was launched on Monday by the Science Ministry at Ben-Gurion International Airport, displaying 60 Israeli developments and scientific breakthroughs that influenced the world to those taking off from the Jewish state. 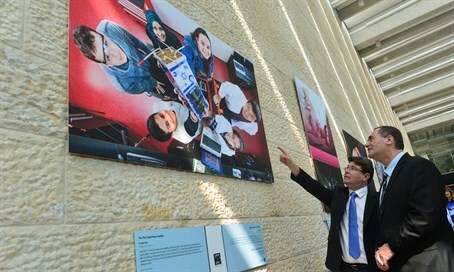 Arutz Sheva was on hand for the inauguration of the exhibit, which Science Minister Ofir Akunis (Likud) explained is meant to show "the truth about Israel" in the face of the negative perception fostered by international media. Akunis, who was accompanied by Transportation Minister Yisrael Katz (Likud) in launching the exhibit, explained that 8 million people pass through the hallway of international departures and arrivals every year, meaning the display will reach a wide audience. The minister told Arutz Sheva that "we are proud of our research and our scientists and our technology." Rona Ramon, the widow of Israeli astronaut Ilan Ramon who tragically died in the Columbia space shuttle crash in 2003, said, "we're such a young nation with so many achievements that this definitely makes us feel good to belong to this kind of people." The new exhibit is to remain for a year on the large wall in the area after passport control. At the launching ceremony, Akunis said, "we are leaders of ingenuity, a light to the nations, a small and young nation with enormous achievements in the fields of science and technology that world powers would be proud of." "The developments and the discoveries presented here are cornerstones of Israeli science. They improved the quality of life in the world, brought economic prosperity, save lives throughout the world and established Israel as a scientific superpower. This is the most powerful public relations activity that we can do." The exhibit is also meant to raise awareness among Israelis of their own country's accomplishments. A new survey by the Science Ministry found that 43% of Israelis did not know that former President Chaim Weitzman's original profession was as a chemist, and found around half of all Israelis can't name a single Noble Prize winning Israeli scientist. In addition to the top 60 Israeli developments to science, the exhibit presents the leading scientists responsible for the achievements. The exhibit displays the more commonly known Israeli developments such as cherry tomatoes, USB flash drives, "PillCam," Intel processing chips and numerous other inventions. But it also features some less well known feats including a method to engage immune cells so as to treat cancer, technology for early disease diagnosis based on speech only, Alzheimer's and Parkinson's disease treatments, the development of seaweed able to heal heart tissue, and many more.